The Reverend William H. Crawford was recognized in his own day as the founder of “The New Allegheny.” His twenty-seven years in office left it mark­edly al­tered in almost every way. Born in Wilton Center, Illinois, on October 6, 1855, Crawford earned a Bachelor of Arts and a Master of Arts degree from Northwestern University in 1884 and 1887, and a Bachelor of Divinity degree from the Biblical Institute of Evanston, Illinois, in 1884. From 1884 to 1886 he was pastor of the Ravens­wood, Chicago, congregation and then served at Fulton Street for three years. From 1889 to 1893 he taught the history of theology at Gammon Theological Seminary in Atlanta. His election as president of Allegheny was unexpected. 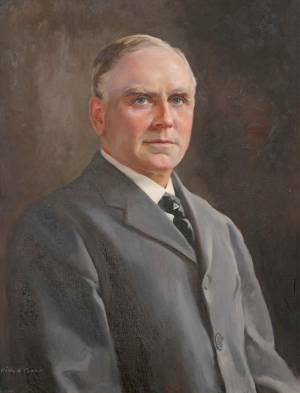 At thirty-seven, Crawford was the youngest of all Allegheny presidents to that time, except for Wilbur Williams. His energy and self-confidence complemented each other. Skill as a platform speaker won the attention of those who did not know him well. Those who did were impressed by his concern for them personally and by his ability to bend every effort to the betterment of the institution. He inspired confidence and himself drew strength from a deep religious faith. As a cleric and a college president he guarded his public persona. He would not don old clothes and help plant shrubbery; when the College newspaper omitted “Mr.” after “Reverend” he admonished it. Crawford’s firmness stabilized operations and assuaged doubts. His influence upon the College in terms of focus of mission, scholastic standards, moral behavior, and “clean” athletics was huge. It was he who concentrated the institution’s energies on undergraduate education, ending doctoral programs and linkages with the Meadville Conservatory of Music and the Meadville College of Business. He guided the College though choppy waters as the Methodist Board of Control relinquished its role and alumni gained permission to elect some trustees. In collaboration with Frank Arter he established the College’s own endowment fund distinct from those of the Methodist Church. He also joined with leaders of sixteen other institutions to found the National Collegiate Athletic Association. One solid measure of Crawford’s greatness as a planner and builder is still visible today. When he came to the College in 1893 there were four major structures; when he retired in 1920, there were twelve. Buildings added to the campus included a gymnasium, a heating plant, Newton Observatory, Ford Memorial Chapel, Reis Library, Alden Hall, Cochran Hall, and Carnegie Hall. The faculty had grown from six to thirty-five in number with fourteen full professors in contrast to the four when Crawford assumed office. In 1893 the only College endowment was the Lindley scholarship fund of $10,000. The coffers of the Centenary societies of the Erie and Pittsburgh conferences held about $150,000. By 1920 the College’s endowment amounted to $850,000, plus the somewhat depleted Centenary funds. In 1893 enrollment at Allegheny numbered 118 undergraduates and 119 preparatory students. In 1920 there were 529 undergraduates. Crawford’s leadership won the respect of the faculty and townspeople. In a governance system that already gave czar-like powers to the chief executive, Crawford enhanced his personal stature vis-à-vis the boards and faculty by his accomplishments. In the last years of his presidency his benevolent dictatorship became a touch too authoritarian for the likings of some, who, for the most part, saw the wisdom of keeping silent. Yet even an unpleasant disagreement such as that over the contract renewal of a professor of English would in time prove beneficial, forcing the College to review and to regularize its appointment practices. The release of a professor of German as war fever rose was lamentable, but more a reflection of the Germanophobia of the country than of a Crawford weakness. The president’s likes and dislikes were so strong that they colored campus culture; they were, however, greatly shared by a number of faculty, especially the senior and most productive. Crawford’s leadership capacity is attested by his ability to enlist strong support from able teachers and scholars, some of national reputation, such as William Elliott ’89, William Dutton, James Montgomery ’77, Camden Cobern ’76, Richard E. Lee, and Clarence F. Ross ’91. In his final baccalaureate address of 1920 Crawford described his administration as having three phases. From 1893 to 1901 he grappled with financial depression and small matters. From 1901 to 1910 he began to implement the “New Allegheny.” The years from 1910 to 1920 were those of larger realization, of a dream slowly coming true. His creed as president, he said, had two cornerstones: a Christian college must serve its students in a fuller way than secular institutions if it were to merit existence, and faculty in a Christian college stood in the same relation to their students as ministers to their flocks. Crawford received many honors and honorary degrees. He expanded his widely delivered lecture on the Florentine monk Savonarola into a book in 1906 and published The Church and the Slums in 1908. To mark the Thoburn jubilee of 1909 he also edited a volume of sermons on Thoburn and India (1909) and later one comprising addresses on The American College (1915) given at the College centennial. A trustee of the Carnegie Foundation for the Advancement of Teaching, in 1909 he was elected president of the Association of College Presidents and Principals of Secondary Schools of the Methodist Episcopal Church. From December 1917 to May 1918 he served in France with the YMCA. After retirement in 1920 he became a national officer of Phi Beta Kappa, re­mained active in Kiwanis, and lived in Meadville. The success of his public career was not free of personal sadness. His daughter died unexpectedly while a student at Johns Hopkins University. His son, a classical scholar, suffered an eye injury while fencing that caused such pain and mental distress that he shot himself. It fell to Crawford to speak at memorials for two of his successors as College president in whom he had placed great hope. Crawford died on March 6, 1944, and lies in the College lot in Greendale Cemetery. * This account is taken with permission nearly completely from J. E. Helmreich, Through All the Years: A History of Allegheny College. Meadville, PA: Allegheny College, 2005.